Note: This is not an event entry. Available ONLY at one of the pack pickup opportunities. Indy taking place on Tuesday May 15, 2018 in beautiful Speedway, Indiana right on Main Street! Daredevil Brewing Co will play host to this epic evening of fun, and our friends at Tacos & Tequila will cater. Race starts at 7PM and at 7:01 PM the Taco Bar complete with multiple Taco (even "Gringo" Tacos) options, and chips/salsa will open! 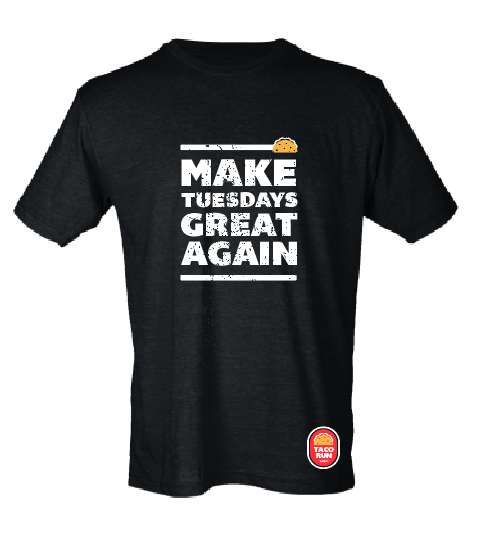 Race Shirt: "Make Tuesdays Great Again"
When this page loaded, the official time was 8:01:30 AM EDT.